WR Jamison Crowder vs. CB Orlando Scandrick – Over the last five weeks, Crowder has developed into the type of receiving threat that many expected him to be at the start of the season. From Week 8 to 12, he’s seen 38 targets (nine more targets than he saw from Weeks 1 to 7) and has amassed 412 receiving yards. Running 70.5 percent of his routes from the slot position, he’s put up an average of 2.67 yards per route run from the slot, the fifth-best mark among pass catchers, so on Thursday night, he can look to add to his latest run of good form and take advantage of his matchup against slot cornerback Orlando Scandrick. Through 12 weeks, Scandrick has surrendered 1.04 yards per slot coverage snap, which ranks 24th of 52 qualifying slot cornerbacks. RB Samaje Perine vs. DI Tyrone Crawford – Coming off back-to-back 100-yard rushing games, Perine has the chance to further show the coaching staff that he is capable of handling an increased workload going forward. Over the last two games, Perine has ran very well, and averaged 3.23 yards after contact per attempt, the fifth-best mark among running backs with at least 25 carries in that span, while also tallying 63 rushing yards on three ‘breakaway runs’. 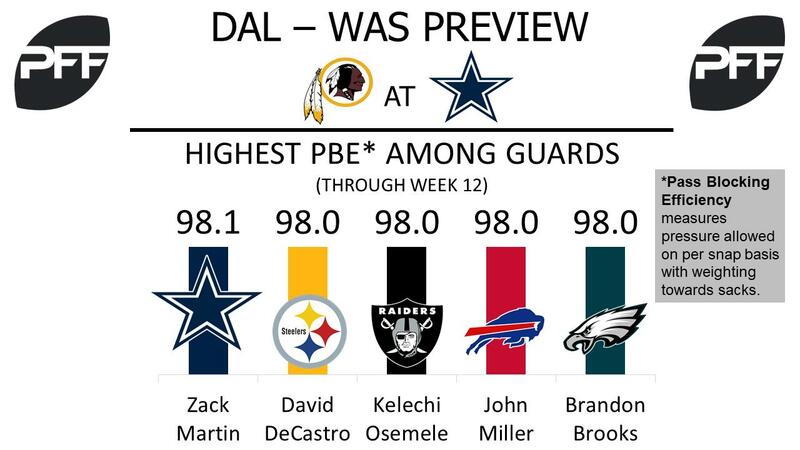 In his third game as starter, Perine will be looking to continue his recent performance, but he’ll need to stay away from Tyrone Crawford, who has been the best run defender on the Cowboys defensive line. Through 12 weeks, Crawford’s run-defense grade of 81.0 ranks first among Cowboys defensive linemen and 28th among 118 interior defenders. T Morgan Moses vs. Edge DeMarcus Lawrence – Since injuring both of his ankles in his team’s Week 7 contest against the Philadelphia Eagles, Moses has done his best to stay on the field for his team, and has missed just four snaps despite his injuries. However, it seems to have taken its toll on him in pass protection, as he’s allowed two sacks, two hits and nine hurries over the last five games, resulting in a pass-blocking efficiency of 95.0, 24th among tackles in that span. Moses will need to improve if he’s to fend off DeMarcus Lawrence, who has produced a pass-rushing productivity of 13.6 so far this year, good for second among 4-3 defensive ends. T La’el Collins vs. 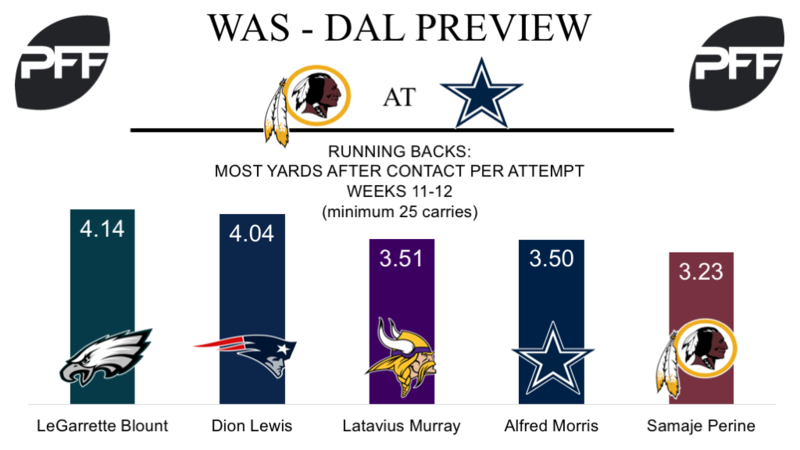 Edge Ryan Kerrigan – In Week 12, La’el Collins allowed three total pressures on 29 pass-block snaps, giving him a pass-blocking efficiency of 92.2, 50th among 65 qualifying tackles that week. Collins’ overall grade of 45.7 has him ranked 62nd among 80 qualifying tackles this season. He will see plenty of Ryan Kerrigan on Thursday, as Kerrigan has rushed the passer from the left side on 85 percent of his pass-rush snaps this season. His pass-rush productivity (measures pressure created on a per snap basis with weighting toward sacks) of 12.8 is currently tied for eighth among 110 qualifying edge defenders. G Zack Martin vs. Dl Stacy McGee and Ziggy Hood – Zack Martin continues to dominate. Since entering the league in 2014, Martin has yet to post a season grade below 85.9. He currently boasts an overall grade of 88.0, second among 77 qualifying guards. His pass-blocking efficiency of 98.1 is first among 75 qualifying guards. Expect the dominance to continue, as Martin is projected to see a combination of Stacy McGee and Ziggy Hood, the 79th and 117th rated interior defenders in the league. WR Dez Bryant vs. CB Josh Norman – Dez Bryant has seen 60 catchable targets this season, 11th-most among wide receivers. Unfortunately, Bryant has had issues with drops, dropping seven of those passes, tied for the fourth-most among wide receivers. His drop rate of 11.67 currently ranks 17th among 84 qualifying wide receivers. Bryant has still shown flashes of his playmaking ability this season however, as he currently ranks 20th among 116 qualifying wide receivers with an overall grade of 80.4. Josh Norman is still one of the least-targeted cornerbacks in the league, drawing just 9.5 coverage snaps per target the sixth-best rate among 119 qualifying cornerbacks. He’s allowing a reception every 15.9 coverage snaps, tied for the 10th-best mark.